Ben Strauss: Surging Seas. Will your city be underwater? As Chicago and much of the east coast sweats out the effects of climate change this week -- 80+ in March (and Arizona gets snowed on) -- a new report on oceans shows sea levels are predicted to rise as much as much as 20 - 80 inches this century. Surf's up! 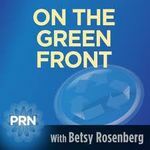 We'll chat with Ben Strauss, COO at Climate Central, about other chilling predictions for our life support system if we continue emissions as usual.